Miracle Food Network I Ferndale, WA I Local Non-profit Org. Across America, 14 out of every 100 people are forced to choose between rent and food each month.....while 40% of food grown, processed and transported in the United States will never be consumed. If we captured just 2% of the food waste fit for consumption, we could solve the problem of hunger in America. 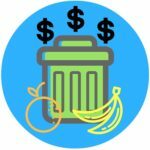 40,000 households in Whatcom County Washington alone waste an average of $125 a month on food. That is $5 Million a month of food waste going to the landfill and producing methane, damaging the environment. Together, today, we can end hunger. Miracle Food Network (MFN) attacks the war on hunger through food hub sponsorships. The choice between rent and food is a reality for many families in America. No one should be hungry while mountains of food go to waste in landfills. We make a difference as we intercept and redirect food surplus and waste. We are releasing families and individuals to live free of the burden of food insecurity in their households. Around us, every day people, facilities, equipment, and food are idling on standby waiting for opportunities. The Miracle Food Network (MFN) aggressively identifies - pursues dormant resources - in the fight against hunger. MFN takes the hunger- fighting tools - equipment, materials, or people - to the battlefront where resources can be put to use immediately. People in poverty are often caught in cycles of dependency. Miracle Food Network (MFN) empowers people trapped in poverty's grip through meaningful work, safe shelters, and support systems. We believe in people, and when equipped and supported they will find sustainable pathways to health and happiness in their own lives and communities. Two critical parts to this solution: "ensuring access to healthy food as well as nutrition education". New research suggests that learning how to cook as a young person lead to better eating practices—and better health—later in life.